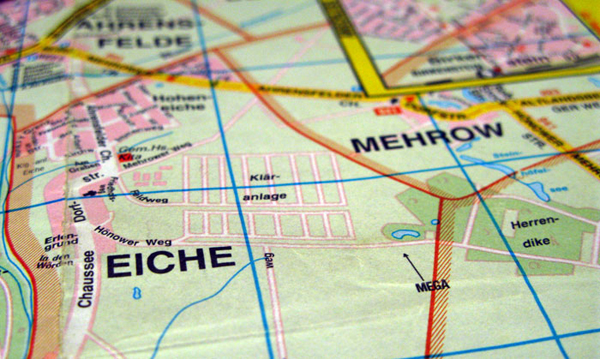 Mega is situated close to Ahrensfelde village, Germany (52°33.483N, 013°36.750E). It is mentioned in Falk Berlin -map from year 2003, but it has disappeared from later editions. Mega is a mistake on a map, but also loophole in the system of political, cultural, functional, social and historical locations. It is a non-place that questions land-owning and borders - as well as the whole global economical system related to them. Mysterious Mega website is a collection point of Mega materials during seven days stay on location in April 2008 and beyond. There was a clay house build in Mega and the findings of the project were exhibited in "Time of Distance" serie of art events 18. - 27.4.2008. Two galleries including Field in Berlin (Augustrasse 65) and Maa-tila in Helsinki (Albertinkatu 19) presented Mega stop motion animation and Museum of Mega - the remains of the clay house. Mega is supported by Arts Council of Finland.